Zeki (15) is passionate about the outdoors and conserving wild places and he would like to travel the world through the eyes of bushcraft to learn the ancient skills of co-habiting with nature. He is aware that many people think the word ‘bushcraft’ just means the building of shelters and fires, so he would like show others that it is the way our ancestors survived and the way that some nomadic and pastoral tribes still do; it is a way of caring for the land and all that lives on it; and it is a way of making sure the natural world survives. As a subject bushcraft combines anthropology, ethnobotany, ecology, geology, and zoology so Zeki has given it a new name – ‘bushology’ – and he would like to bring back the knowledge and ancient skills he acquires to a wide audience in the hope that he will inspire others in Scotland. Whenever he can, Zeki is out in the woods or in the hills, practicing his craft or working on a conservation project. He has completed his John Muir Discovery and Explorer Awards and he is researching mountain hares and their habitats for his Conserver Award. He has helped to lead various Duke of Edinburgh groups in Moray and he has assisted at workshops on bushcraft and outdoor learning. 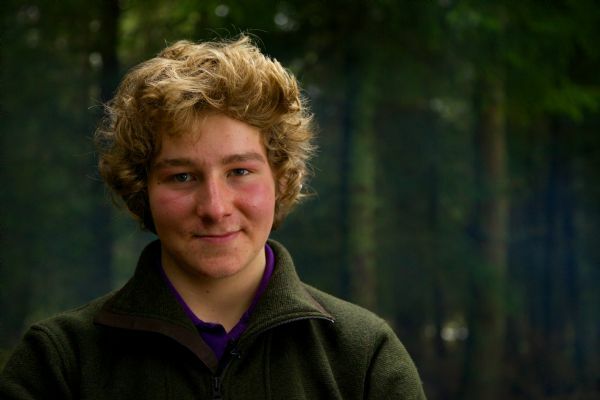 In June 2014, Zeki was awarded “Young Adventurous Learner of the Year 2014” by the Cairngorm National Park; in November 2014, he gave the keynote speech at a National Conference for Outdoor Learning organized by Education Scotland; and in February 2015, he was announced winner of the first Youth Award for Excellence in Mountain Culture and has since become the first Ambassador of the Fort William Mountain Festival. With the way that technology has taken over the lives of young people, Zeki is very keen to try and inspire others to explore the natural world and develop a passion for it. If he can’t capture the interest of his generation, he is concerned that many skills will be lost and there will be a complete disregard for nature. If he can succeed as a role model to preserve and conserve our precious environment and all that lives in it, he will be one happy chap!